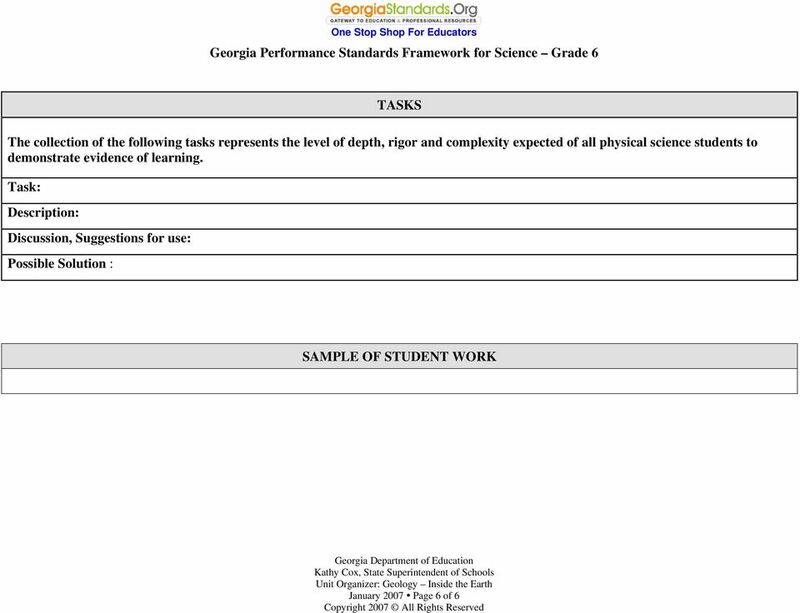 Download "Georgia Performance Standards Framework for Science Grade 6. 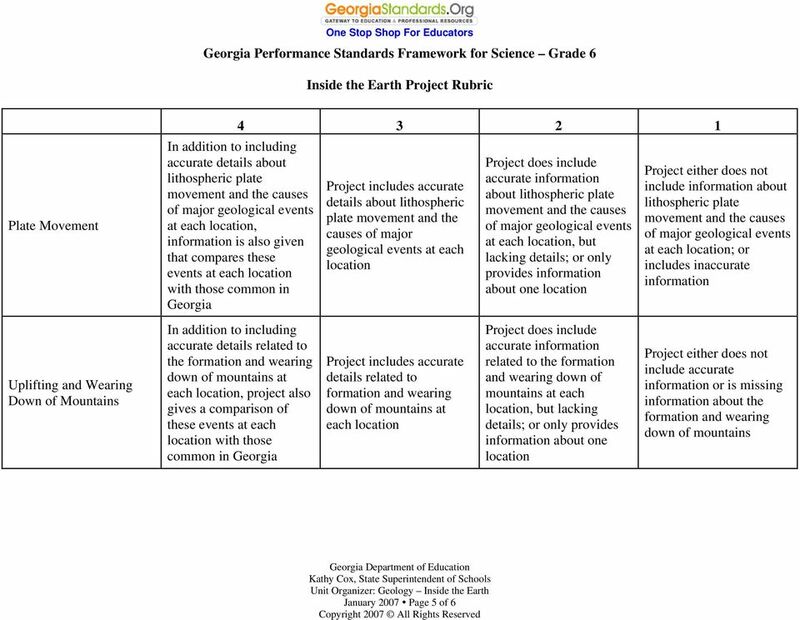 Unit Organizer: Geology: Inside the Earth (Approximate Time: 7 Weeks)"
3 At convergent plate boundaries known as subduction zones, a trench and deep earthquakes mark the zone where a slab of oceanic lithosphere descends into the mantle, and volcanoes and mountain ranges form on adjacent land. When continental crust meets continental crust at a convergent boundary, a collision occurs, resulting in folds, faults, and high mountains. Transform boundaries are where plates slide past each other. 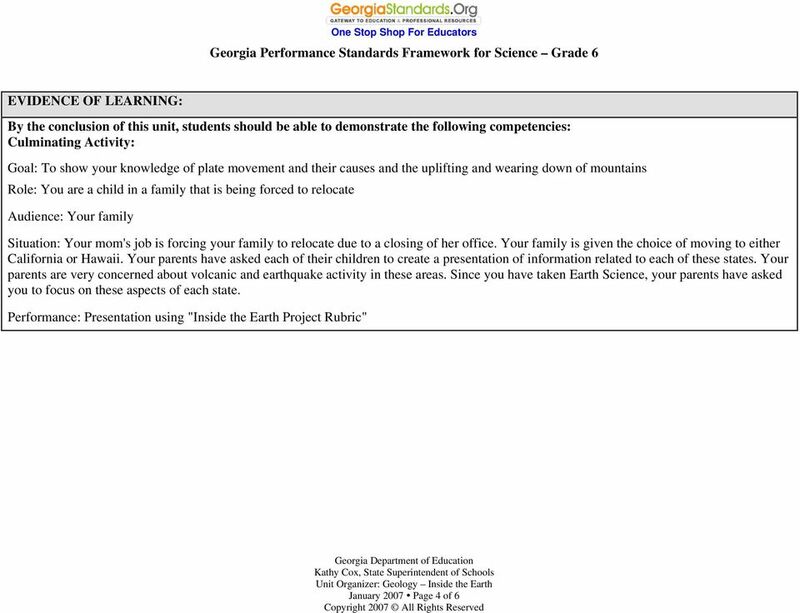 They connect other plate boundaries and are characterized by earthquakes. 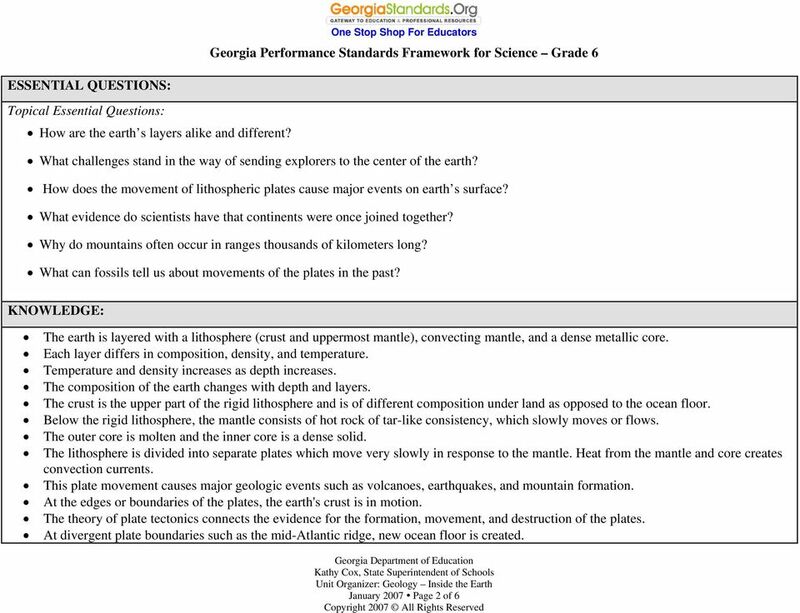 CONCEPTS: Plate Tectonics, geologic events/time, Earth processes LANGUAGE: Plate Tectonics, Magma, Continental Drift, volcanic activities, convection currents, plate boundaries, fossil evidence, Subduction Rifting Transform faults Map of plate boundaries Earthquakes Volcanoes MISCONCEPTIONS The world map is unchanging; or a major change - such as California separating from North America - could happen within my lifetime. Earth has always looked as it does now; Earth began with a supercontinent called Pangaea, which broke up to make the present continents. The mantle is molten everywhere; volcanoes happen whenever the crust is thin enough for magma to break through. PROPER CONCEPTIONS Moving plates cause major changes in a world map over tens of millions of years. Pangaea was the most recent of a succession of supercontinents that have formed and broken up over time. The mantle is solid but capable of flow (like hot asphalt or fudge). 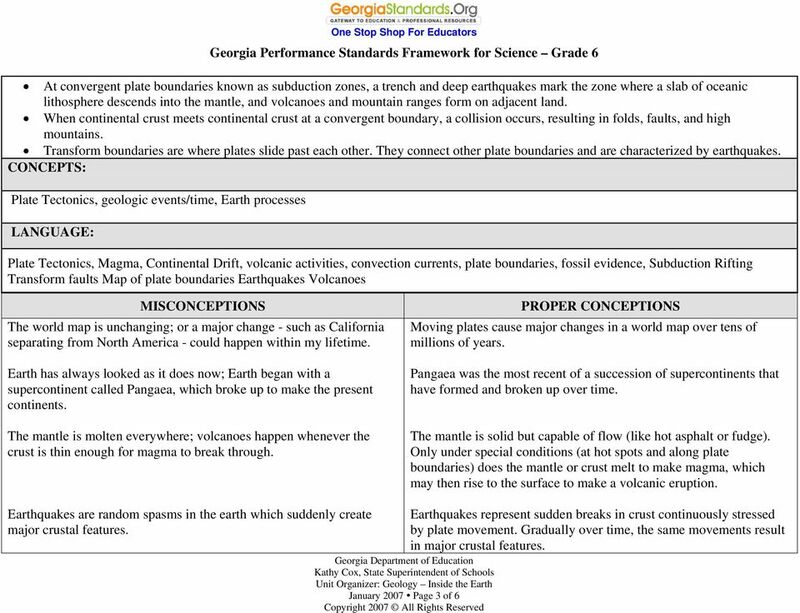 Only under special conditions (at hot spots and along plate boundaries) does the mantle or crust melt to make magma, which may then rise to the surface to make a volcanic eruption. Earthquakes are random spasms in the earth which suddenly create major crustal features. 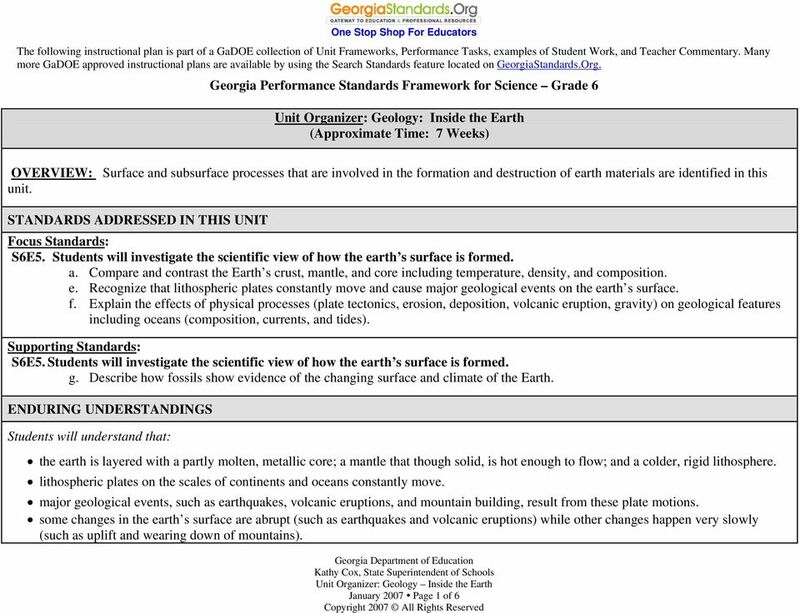 January 2007 Page 3 of 6 Earthquakes represent sudden breaks in crust continuously stressed by plate movement. Gradually over time, the same movements result in major crustal features.